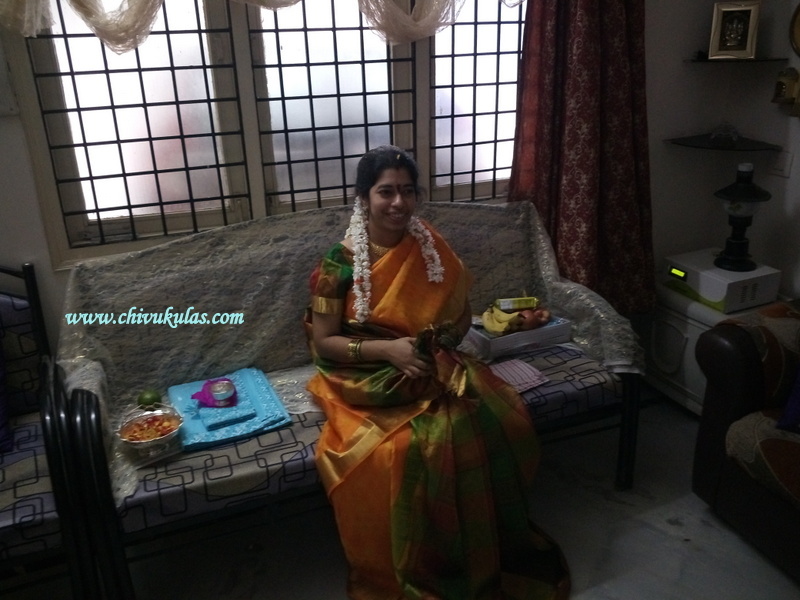 Seemantham is a traditional south Indian way of celebrating baby shower. The same is celebrated in north India as 'godbharai' (god (in this word 'd' is pronounced as 'the') means lap in Hindi and bharai means to fill). The celebration differs from region to region. Seemantham is also known by the names 'poolu mudupu' (i.e adoring flowers in the hair) and 'gajulu todagadam' (i.e wearing glass bangles) in Telugu. It is celebrated in the 5th or 7th or 9th month of pregnancy. Seemantham is one of the 16 Hindu samskaras known as 'simantonnayana' in Sanskrit. It is a samskara of the embryo / fetus that develops in the pregnant woman's womb. Mostly, seemantham is celebrated for the 1st pregnancy only and not for the subsequent conceives. There are certain superstitious believes on celebrating the function. In the olden days, people believed that pregnant women are easily prone to evil eyes / attacks. Goddess 'Sri' (a form of Lakshmi Devi) is invoked to ward off the evil and to protect the pregnant woman. The main intention of celebrating the function is to seek the blessings from the elders for a safe delivery and for a healthy and long life of the unborn baby. Scientifically, the pregnant woman should take utmost care of her health (both physical and mental) for the healthy growth of the developing fetus. It is important to keep her always in good moods and positive thoughts. 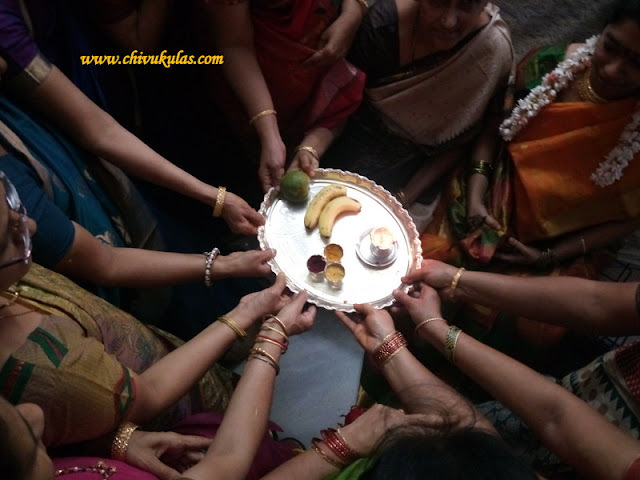 So, the celebration of Seemantham which involves a family get-together with laughter and sumptuous traditional meal, brings smiles in everyone and there is a spread of happiness and joy all around. Usually, the function is celebrated by the in-laws of the pregnant woman. 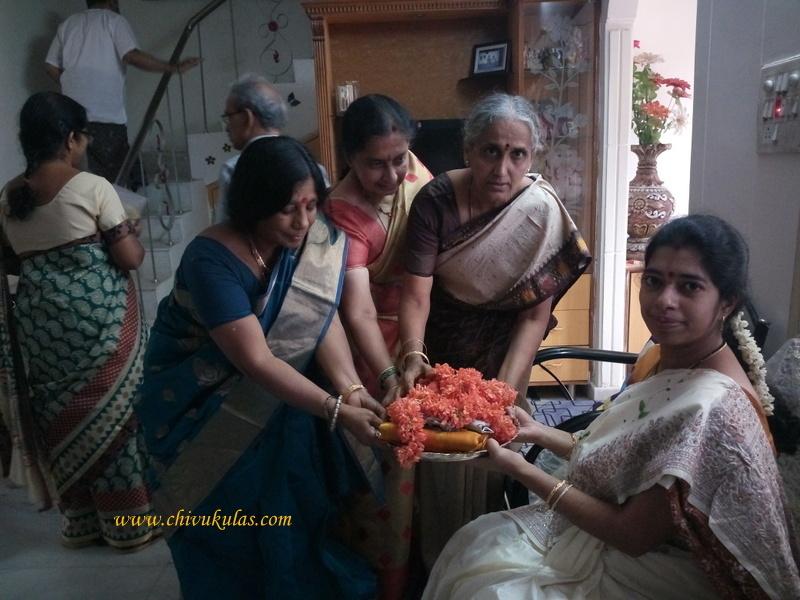 Parents of the pregnant woman and the near and dear ones are invited for the function. 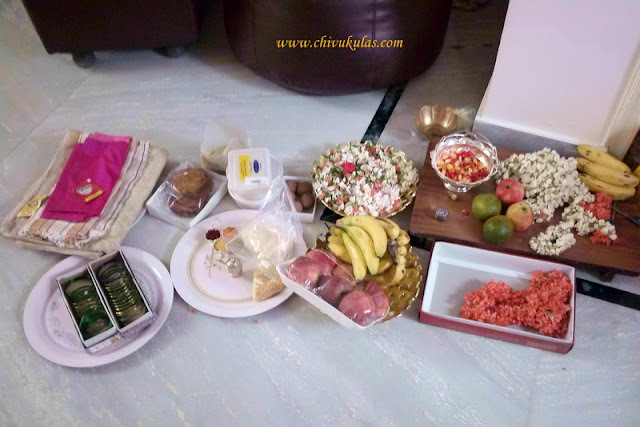 As per custom, parents get varieties of sweets, fruits, flowers, traditional glass bangles, new sari (for the pregnant woman and her mother-in-law). Most importantly chalimidi (a special sweet made of rice flour and sugar / jaggery) is given to the pregnant woman along with sweets and fruits. All these are placed in her 'kongu' / 'vodi'. Kongu is the veil of the sari which is spread on the left side back. The woman brings the veil to her front on right side and holds it like a pouch. 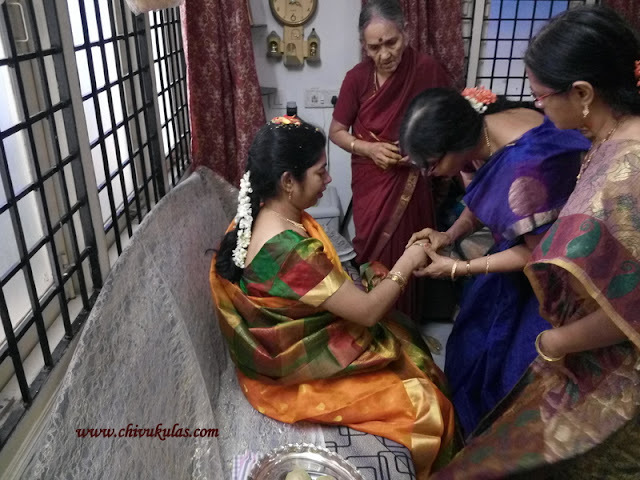 The procedure for Seemantham is simple when compared to traditional Hindu marriage. On a auspicious day and at the auspicious time, the pregnant woman is seated on a chair normally facing East. 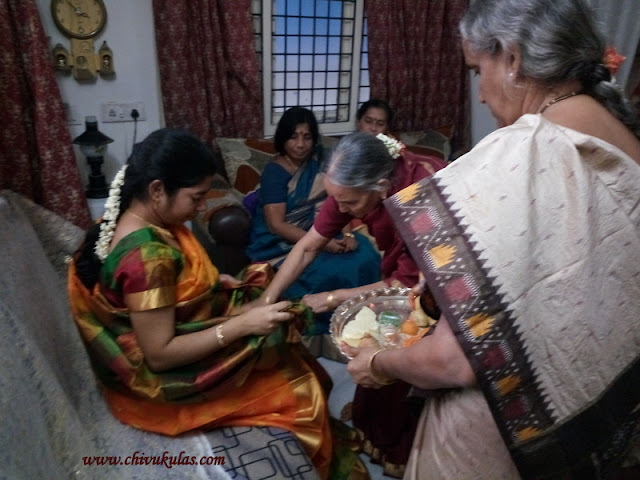 Her mother, mother-in-law and other elderly married women from the invitees offer her gifts (mostly sari). Her mother applies turmeric paste (pasupu) on her feet, kumkuma (vermilion) on her forehead between the two eyebrows, gandham (perfumed paste) on her neck and then adores her hair with string of seasonal flowers (jasmine flowers). Her mother then puts traditional green glass bangles into both the hands of her pregnant daughter. This is followed by the other elderly married women who have motherly relation with the pregnant woman who put glass bangles into her hands. 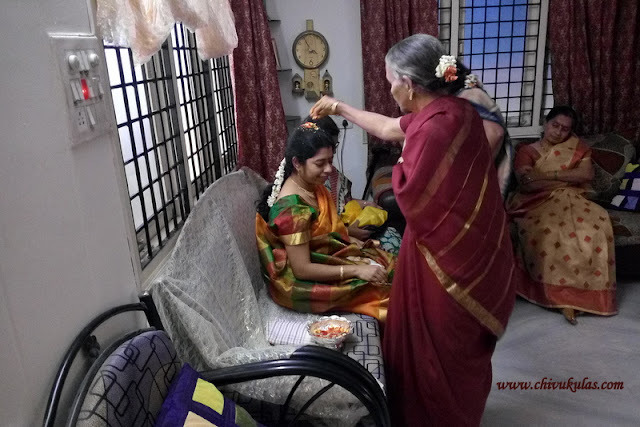 And then all the elderly people bless her with 'akshantalu' (placing rice mixed with turmeric powder on her her) when she touches the feet of the elders as a gesture of respect. Finally it ends up with 'mangala harati' when the elderly married women wave 'harati' to the her. And sing 'harati' songs like ksheerabdhi kanyakaku. The function culminates with the 'mangala harati' and of course goodie bags (return gifts) to the invitees.